As I mentioned in my last post, I went to a family event this past weekend. While there, I bonded with one of my nephews—a nephew I'd always hoped to bond with. He's either 13 or 14. Not sure which. And, since he was a toddler, it was clear he wouldn't be making conventional choices or walking a conformist path in life. At his young age, he is already set on owning a hair studio and spa. He doesn't shy away from being the center of attention. He has definite opinions he's anxious to share. He's very handsome. And he oozes Sadler charm. He's also blessed with two parents who support his individuality fully. If there's one thing I'm proud of with my brothers and sisters it's that they're all very good parents. This nephew is the first of my relatives to show an interest in the cards. I have some relatives who show interest in getting readings, but he's the first who wants to learn how to give them himself. I regret not bringing a tarot deck with me, because that's the system I know best. But I did have a Lenormand deck with me and, within a few minutes of playing around, he was picking up on it quite well. Tonight I will pack up my Keywordy Lenormand deck, my Everyday Lenormand deck and a copy of Rana George's Essential Lenormand for him. Between those three tools, he should have everything he'll ever need. Acquiring, then sharing, knowledge is something I enjoy. In a way, that's what my advertising copywriting career is about. I learn about a product or service, then I translate what I've learned into an ad that tells the world the best parts of what I know. It's the same with this blog. Here I'm sharing the knowledge gleaned from the spiritual and internal work I've done and am doing in this lifetime. 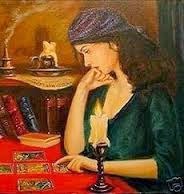 Cartomancy (reading cards) and the psychic arts are something I've been studying for 25 years and I have transferred my style of reading to many students along the way. But having a family member interested, even if he eventually grows out of it, is kind of like passing a gauntlet. I had never thought of it before, but as a childless person, I don't imagine I'll have many opportunities to start a tradition that goes generations. So many in the cartomancy world are second, third or millionth generation readers and they bear the energy and quirks of that. I'm a first-generation reader and am, largely, self taught. It's interesting to think that someone generations from now may echo my style for no other reason than because that's the way I did it and the way their teacher learned. Everyone thinks it takes some special talent to read cards or communicate with spirits. The truth is, it doesn't. Some people, yes, are born with a natural talent for it. But I'm not one of them. Whatever I'm able to connect with in the great mystery out there has come through study and practice over many years. In fact, cards are nothing more than tools we use to help us access that inner knowing...in some way they're like really elaborate training wheels that most of will never take off because we like three-wheeling. Most of the readers I know could give people messages without using cards, but the cards help make the readings more detailed, imo. I'm grateful to my younger self that I developed a skill outside of my profession that I'm just as adept at as my profession. One day my nephew will be styling Katy Perry's hair by day and reading her cards by night, all while "just knowing" what decision to make next to fuel his life's success. I think one of the most valuable gifts a person can give themselves is to build and develop a strong intuition and a relationship with the divine. For me, the cards have helped me do both. And I can't tell you how much it means to me to help my nephew give himself the same gift.